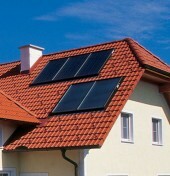 Home › Firms › Bramac Roof Systems Ltd. The company specializes in roof systems - concrete roof tiles and accessories for all kinds of roofs. Valleys, hips, hooks, ridge vents, roofing felt, skylights, rainwater goods, solar collectors.